Bikes: Xootr Swift. Birdy BD-1. 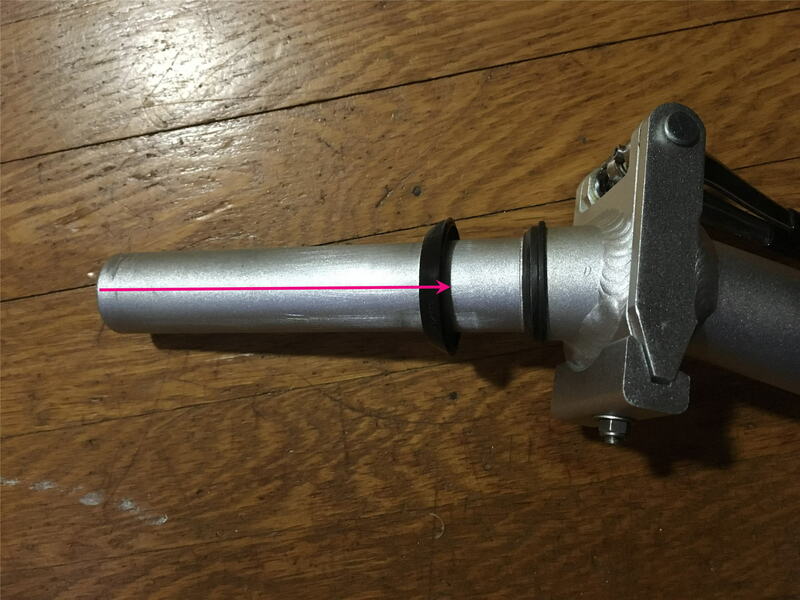 I've found a used steering assembly to replace the original on my Birdy BD-1, which had cracked along the weld of the handlebar clamp. I've never replaced a fork, or in this case a steering assembly that fits into the head tube, and I'm wondering if it is common that a ring or seal will slide easily onto the tube most of the way, and then suddenly stop dead, as if the OD of the tube had suddenly become larger. Please see the picture. The seal slides all the way up easily but then stops with an inch or so remaining. I've gently sanded the inner metal ring's edge with very fine grit paper so that it's shiny. There's no gunk or residue of any kind, and I've cleaned the tube itself. Is it normal that the seal ring will have to be forced onto the tube, using PVC tubing and a hammer, or a tool designed for that purpose? I've never seen a Birdy in person, so I'm just guessing here. What you are showing is the bottom of the "stem" (handlebars are to the right out of the picture) which fits into the top of the fork or steering tube. Is this correct? Or does the shaft (with arrow) fit through the headtube of the frame, and then does the fork assembly clamp to the end on the left, which is effectively the bottom of the steering column? I'm guessing my second guess is the correct one. That the Birdy uses a reverse approach from most modern traditional road and MTBs, that the stem holds the fork in place. In this case the fork holds the stem/bars in place. If this is the case, are you certain the "seal" (black ring on left) is for the upper bearing race (black ring on right)? My guess is that it would fit at the lower end between the head tube and the lower bearing race and just above where the fork assembly clamps to the stem/bar tube. None of the pictures I've found on the Birdy Website depict the area where the fork clamps to the stem/bar assembly. Have you thought about contacting them?